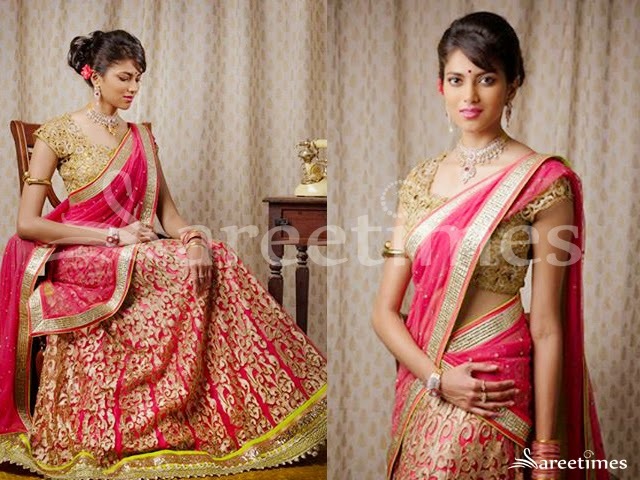 Trendy party wear designer sarees by Souchika. 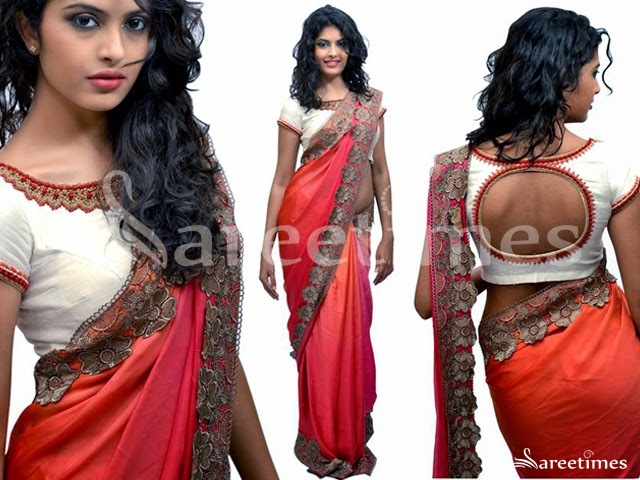 South Indian actress Bindu Madhavi in beautiful saree collection. 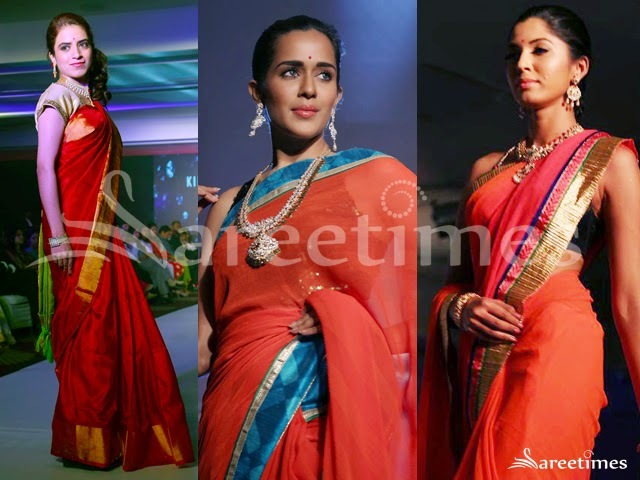 Bollywood actress Zarine Khan saree collection. Left: South Indian actress Vandana Menon in half and half saree in silk mixed tissue materials, It is green and multi colors combination. tri colors thread floral work embellished nice pleats teamed with gold shimmer chanderi border, parrot green pure silk pallu, paired with contrast cream color silk full sleeves designer blouse with round neck pattern. Middle: Black pure chiffon saree with attractive red fancy ribbon border, and multi colors painted rose flowers enhanced across, Paired with polka dots quarter sleeves round neck blouse. Right: Vandana Menon in white pure Georgette designer saree with purple color lace border, followed by dual color fancy outlines, small gold polka dots enhanced across, Embroidery floral woth contrast purple top border, Paired with full blouse with cap sleeves and brocade work. 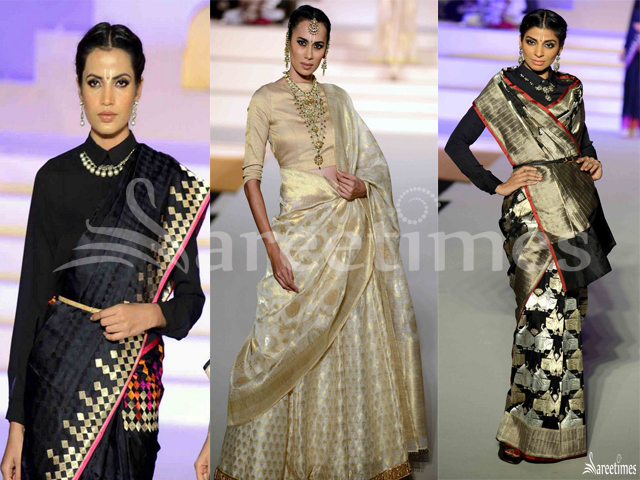 Bollywood celebrities walked for designers collection at Lakme Fashion Week Winter/Festive 2014. Bollywood actress Rani Mukherjee in beautiful designer sarees. 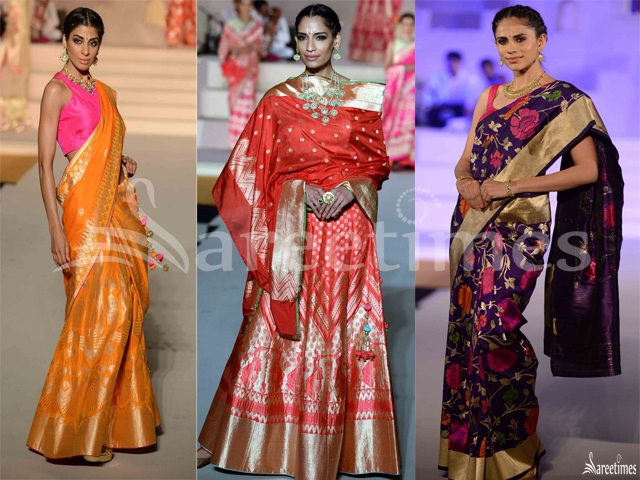 Bollywood actress Bipasha Basu in beautiful designer sarees.